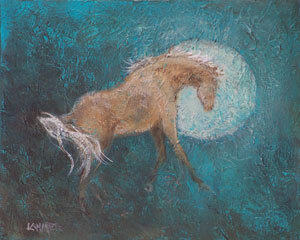 The Witching Hour, after midnight under a full moon a palomino bucks feeling the spirits of the night. This lovely Spirit Horse is really shines in the brightness of the moon. The texture of the muted turquoise blues have a batik quality contrasting nicely with the gold and sienna of the palomino horse. The Witching Hour is a lovely print on archival somerset velvet paper.